Or like me had technical difficulties, here (via stray) it is. Get it while you can! 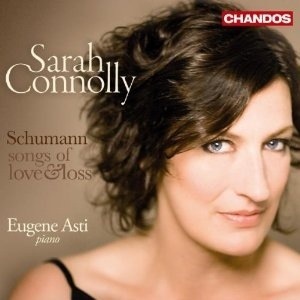 For any given piece of music, I seem to encounter Sarah Connolly’s performance of it only after I have someone else’s in my head, and I end up comparing the two whether I want to or not. I’m going to see if I can avoid it here. Not because any comparison I can think of would be unflattering to Connolly (it wouldn’t) but because that kind of thing can get annoying after a while. Not that I wasn’t enjoying the things that I had heard many times before – by the A section repeat of the first track, “sta nell’ircana” from Alcina, I was completely on board. But the developing sense I mentioned of particularly liking the things that were less familiar was overturned decisively by Connolly’s rendition of “scherza infida.” The tempo is slow, but both singer and ensemble know exactly what to do with the long phrases – you can hear every detail of the lute part for example (there’s a bit right at I think the transition to one of the later repeats that’s fantastic) and Connolly does some amazing things with dynamic contrast in the second half. I wish there was a recording of her singing the whole role. There are several recordings of Schumann’s Op. 39 Liederkreis, studio and otherwise, that are very close to my heart. 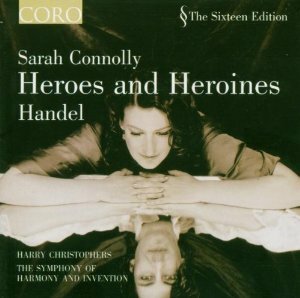 Having heard Sarah Connolly singing Handel last week I was curious what her interpretation of this song cycle would be like. The version of this that I’m most used to is Röschmann’s, in various bootleg formats. She performs this cycle with her characteristic drama and intensity. Connolly’s version is less visceral but very beautiful. And I had a lot of time to consider my options, purchases-wise, because I was stuck overnight in Atlanta. In the airport. Apparently I don’t rate a hotel voucher. Though I have to say, I slept well – the seats there don’t have arm-rests, and a Delta employee went rogue and handed out blankets. I also got a free toiletry kit. But it was a dude toiletry kit – razors and shaving cream are of no use to me in an overnight-stranded sort of situation, and I would have appreciated some face-cleaner. (Anyone want a size X-Large men’s t-shirt that says “Delta Sky Team”? Because I have one.) However. It’s over now. And I got to play a fun game of Spot the Debris on the way home! (There is a lot of road debris around here for some reason. Most of it of the formerly alive variety.) I was driving southeast, and on the opposite side of the freeway, I saw a large cardboard box blocking one lane. Like a big shipping container type cardboard box. It shuddered in the wind when the semis went by. I was thinking about stopping and calling whatever the non-emergency version of 911 is, because it seemed kind of dangerous, but then I saw a state patrol car zip by going the other way, and my sense was that whether he or she knew about it in advance or not, that cop was going to find that box. So I went back to listening to Vivaldi’s Bajazet with a clear conscience. It turns out that Super Bowl Sunday is actually a really good day to go to an afternoon performance at Carnegie Hall. When the concert lets out the streets are clear and many of the restaurants are not at all crowded; we were almost the only people on the train back out to Long Island. And none of the other passengers puked on the way! And here I was worried that the game would louse things up somehow. Having experienced the Long Island Rail Road Late Nite Post Party Local (stopping at: Puketon, Little Leering, Loud Dudes, Shrieking, Puketon Again and points east – the first four cars will NOT PLATFORM at Puketon) in the past, this felt like, as they said in the eighteenth century, Heav’n, and one didn’t even have to be killed by the Romans to ride the train. Why refrigerators, anyway? The pattern seems to be (domestically-themed) boxes, toy houses, confined spaces, and cold. Or cold contrasted to warm – we get warmth in the form of the deer’s blood that Diana’s maidens smudge about the place, in the form of hell, behind the fridge, and in Diana’s antagonist, Cupid, who is costumed in bright red and orange and yellow. And bodies on gurneys in morgues, as in Act V, are certainly cold – except when they are revealed not to be dead after all. The tone of this production is both whimsical and sad, in a detached kind of way. Some of the whimsical bits have the effect of both pushing aside and emphasizing the fact we have people sloshing around with buckets of deer blood and the whole thing ends with the execution of Love. (In fact, the whole thing has the same “whimsical and a bit dark but also very glossy and slick and occasionally nudge-nudge” vibe I got from that Glyndeborne Fairy Queen from a while back, and lo and behold, it’s the same director, Jonathan Kent. Well!) We have the refrigerator people in the prologue making a little forest out of broccoli with an orange-slice above for the sun, and dancing around in it – but we also have the very real pathos of Phaedre (Sarah Connolly), who has found herself in an impossible position and pays the price. Have you ever wondered what would happen if you staged an entire Rameau opera on the inside of a French person’s refrigerator? I hadn’t either – but this is why we watch opera, isn’t it. There are always questions that you never even realized you hadn’t asked.